How long has that poor question been soaking in there? Does it have any nitrogen left? The above is one of the joys of cross-disciplinary teaching. I don’t just get to watch the mangling of the English language by Mass Comm. majors and future accountants, but by would-be psychologists and life scientists. I’m reminded of an old New Yorker cartoon, by Jack Ziegler — that showed the Empire State Building with a side of fries. To parallel the above, though, we’d need to have the “concern” that either there was no ketchup, or that the Health Inspector disapproved of the arrangement. “Figured”? The rest of the paper veers away from Proposal territory, out into the realm of “If I Were King of the Forrehhhhhst“….. Coincidentally, BBC Radio is now playing “A Shiloh Farewell”, better known to many as the mournful theme music from Ken Burns’ Civil War miniseries. I guess if one is weary of fighting, perhaps making something beautiful out of the remnants is appropriate. This post probably isn’t it, though. There are times when I’m just stunned. A final paper should show what a student’s learned over the course of the semester. So if the first paper in the term insists on using multiple primary and secondary sources of information and citing them properly, it just doesn’t look good if your final proposal doesn’t do anything of the sort. It instead leaves me with the feeling that you haven’t learned anything this semester, and maybe you should take this class again. With someone else, thank you…. Really now…. There are high school students who know that Ideology is more than a house brand clothing line at Mays-owned department stores, but is there anything about this sentence that captures your attention and says “Hey, would you like to do this for a living”? And then the student will be irritated that I’m not recognizing what a good writer he is, completely missing the connection between “meeting the needs and satisfaction of customers” and adapting his knowledge to the needs of the assigned audience for his paper. But the fact is, the “goodness” of writing is largely governed by who that writing is meant to serve, entertain, or enlighten. If you give me a short thesis on “The Modern Salesperson” for a business professor when I wanted a “Field Guide to Sales Careers” for a high school student, you aren’t going to get an A for your efforts. Festival of Bad Writing — Final Portfolio edition! This post is likely to get several updates over the next few days, as I slog through this semester’s crop of student portfolios. Please note, these are all college juniors and seniors writing…. I gave up marking the other errors when I realized that his statistics all seemed to come from http://www.americangaming.org/Industry/. Look, folks: the more controversial a topic, the longer you need to explain yourself, and the better your sources need to be. In a universe where one of your classmates is capable of taking 5 pages to exquisitely describe a system for improving the neatness of a shared living space, you taking 2 pages to simultaneously dismiss all arguments against casino gambling AND justify a site for having slots and table games, smack in the middle of a currently gridlocked entertainment district is, well, not likely to fly. No, it won’t stimulate anything, either. Irritate, yes. And you really don’t want me irritated when I’m logging final grades…. This folder is starting to look like a one-way ticket to repeating the course, which, blessed be the name of the Lord, I am not scheduled to teach next semester! I’m hoping this one shows up at the sale this summer: ‘Rustler‘ is just gorgeous. Although getting some louisianas and maybe siberians are the priorities, who wouldn’t love this beauty? Rich scent, great coloring, and apparently it reblooms! In other news, I had some students — who did NOT have grade problems — follow me to my office after the last final exam, just to chat with me for a while. I feel very, very fortunate. One of my colleagues was not as fortunate. She has found multiple rings of plagiarists in her classes [more than enough for a circus, and almost enough for the Olympics], and one of the culprits was begging her for a chance to write just one more paper, in an hour, to show that he could really write well on his own, and deserved to pass the class. Plagiarism is a special variety of stupid, in my book. While the roots may be desperation, or contempt, the fact remains that there are millions of word-combinations that a student could choose and NOT plagiarize, so I don’t have much tolerance even for the “but it’s appropriate in my home culture” argument. By setting foot in my classroom, and asking for my instruction, you have pretty much signed a contract that says “I want to participate in your culture, and learn what you have to show me.” That’s not to say I don’t learn things from my students, or that I don’t see value in trying to bridge cultural gaps….but you really do need to do your own work, and you need to be able to prove that to me. Lunch, and then more grading, I think. There was a brief respite from grading yesterday, and also a brief respite from the rain [the state of the lawn, we will not discuss it]. What you’ll see in this post isn’t in my garden. 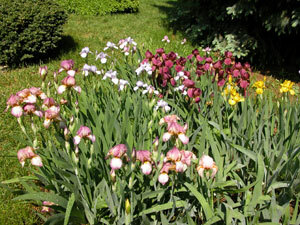 Our first stop is Rebert’s Iris Haven, where Doris Rebert provided a lovely show of historic and modern iris varieties, along with a lovely lunch. 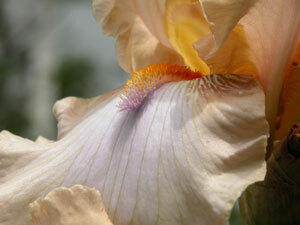 Members of the local iris society ambled about like drunken bees, buzzing happily about what was blooming, what was on the way, and what was in their own home gardens. 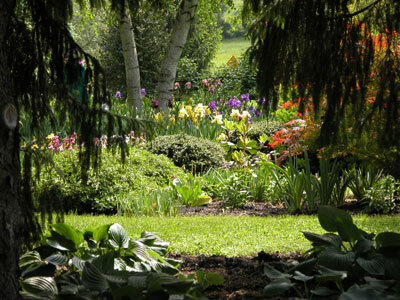 I confess, I was a little homesick when I walked through the shade garden areas; the tall evergreens, the lush hostas and deciduous azaleas… I can’t help feeling that there was a gardening cohort that started out 60 years ago, and I was lucky enough to be the guardian of one of those gardener’s creations for a while. Now I have to start my own from scratch and memory. Some days the challenge is uplifting, but at other times I wonder whether I’ll get to see the place at Elsinore ever look as settled and grand as this. 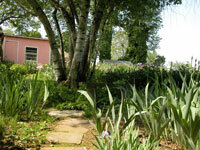 Of course, these gardens are also, I suspect, the full-time committments of these gardeners. 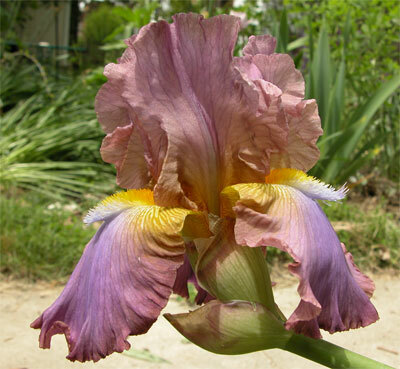 One of the iris beds at Rebert’s was reserved for their “Queens of the Show” — iris that had won regional or national awards. Those weren’t in bloom yet; I may just need to travel out to see them some season, considering how gorgeous everthing else was! 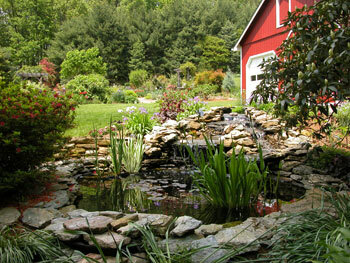 Oh, and who wouldn’t love a little dedicated gardening shed, out away from the house? I know I certainly would. And if we could run power out there so my woodworking equipment could run without endangering the rest of the house, even better. But there’s one more stop on the tour: Draycott Gardens [see also here]. Carol Warner was at the Rebert’s garden and kindly provided maps and directions to her place, since so many of us had made the pilgrimage out to Doris’ place. Talk about garden over-achievement: she participates in the iris, peony, and rhododendron societies, a level of splendid plant-geekiness which I guess one can indulge more easily if you’ve got 9+ acres to play with…. I’ve got enough of a challenge with the space I’ve got! This summer, I do hope to get some raised beds in for my rhodie scions, when they come back from Van Veen’s. As for the peonies, I prefer scented flowers in my yard, which means apparently I’m not a customer for the latest and greatest peony varieties. Ah well. Perhaps that will mean the ones I get will be cheaper? “Now this is more like it!” say the bees. 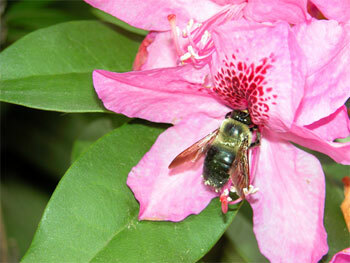 The big bumbles love the rhododendrons and larger azaleas. The smaller bees are delirious about the false indigo that just started blooming; they hover around with their tongues sticking out. There seem to be fewer bees frequenting the exposed clay [which is good, because I finally did get that magnolia into the hole I’d originally dug for it]. 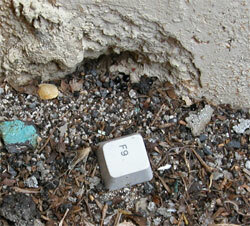 But there’s plenty of wet, exposed clay left…. 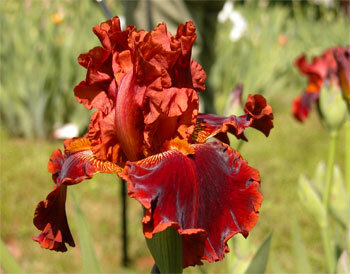 While on the topic of matches between flowers and bees, let’s look at some of the iris that have blossomed recently. 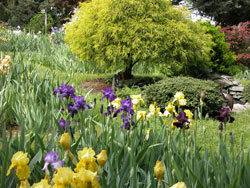 These are from last year’s remarkably-affordable binge at the local Iris Society sale. No, that’s not an optical illusion: the standards are standing up, all nicely ruffled, the falls are draping downward, the beard is…. wait a second…. Yes, those beards are standing proud of the falls, rather than curling downward with them. What had been a convenient landing strip to maximize the amount of pollen a bee could transfer when visiting each successive flower has been bred to display something more like a party favor [or a very particular sort of “pinata”, if you perchance remember an ancient Robin Williams routine]. Here: look at another one — G’night everybody! Elsinore is just recovering from nearly 5 inches of rain [so we don’t want to discuss what the moats in the garden probably look like right now….Am I going to need mosquito dunks for those? Probably.]. The sun is now merrily beaming down on the Italianate house across the way; yellow stucco glaring against green young leaves and blue sky. At the moment, the most subtle thing about that house is the grey DirectTV saucer attached near the back of the roofline. How often is _that_ true about a house?